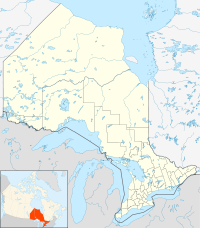 Wabigoon Lake Ojibway Nation, or commonly as Wabigoon First Nation (Anishinaabemowin: Waabigoniiw Saaga'iganiiw Anishinaabeg), is a Saulteaux First Nation band government who inhabit the Kenora District in northwestern Ontario, Canada. It is approximately 19 km southeast of Dryden, Ontario. As of January 2008, the First Nation had a registered population of 533 people, of which their on-Reserve population was 175. The Wabigoon Lake reserve was first laid out in 1884 and was confirmed by the Ontario government in 1915. Members of the Wabigoon Band of Saulteaux living on the western portion of the Indian Reserve moved away and formed the Eagle Lake First Nation. Those living on the eastern portion of the Reserve officially changed its name to Wabigoon Lake Ojibway Nation on August 7, 1987. The First Nation elect their officials through the Act Electoral System, consisting of a Chief and four councillors. The current Chief is Esther Pitchenese, who was re-elected to another two-year term on September 21st, 2017. The four councillors are Lana Kooshet, Ron Williams, Louie Pitchenese, and Tyson Williams. As a signatory to Treaty 3, Wabigoon Lake Ojibway Nation is a member of the Bimose Tribal Council, a Regional Chiefs Council, and Grand Council of Treaty 3, a Tribal Political Organization that represents many of First Nation governments in northwesternern Ontario and southeastern Manitoba. The First Nation have reserved for themselves the 5,209.2 hectares (12,872 acres) Wabigoon Lake 27 Indian Reserve. ^ a b "Wabigoon Lake 27 census profile". 2011 Census of Population. Statistics Canada. Retrieved 25 July 2015.